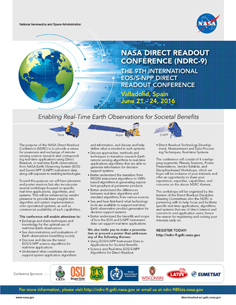 The purpose of the NASA Direct Readout Conference (NDRC) is to provide a venue for awareness and exchange of remote sensing science research and corresponding applications using Direct Readout (DR), or real-time Earth observations from NASA Earth Observing System (EOS) and Suomi NPP (S-NPP) instrument data, along with exposure to enabling technologies. It is also hoped that this venue will foster conversations and collaborations which would help identify areas in Direct Broadcast and Direct Readout (DR) that would improve and/or enhance decision support systems. Toward this purpose we will have plenaries and poster sessions but also incorporate several workshops focused on specific real-time applications, algorithms and systems. This will be enhanced by vendor presence to provide keen insights into algorithm and system implementation onto operational systems, as well as commercial availability of such capabilities. Click here to download the NDRC-9 flyer. Click here to read Enabling Real-Time Earth Observations for Societal Benefits: The NASA Direct Readout Conference 2016, published in The Earth Observer [Volume 28, Issue 6 pp. 22-30]. Click here to download the complete NDRC-9 Proceedings.